Who Served Their Country in Time of War? Over the years, this Rostrum has come to represent our community’s honor to all who have served our country in any of the armed forces but particularly to those who gave their lives during wartime. Immediately after the end of World War One, November 11, 1918, communities across the United States struggled to find fitting memorials for those who had served and to those who gave the supreme sacrifice. Mercersburg was no different. Seven months later, sixteen area WWI vets did respond by applying for and receiving a charter for Mercersburg Harry Lackhove Post 517 of the American Legion. Lackhove had been killed in the Meuse- Argonne offensive only a month before the war ended and his was the second WWI veteran’s body to be interred in Fairview Cemetery. For the next few years Post 517 took on more and more of the responsibility and organization for the Memorial Day services as more veterans began to settle back into normal lives and took on more civic responsibilities. In 1924 over twenty ladies applied for a charter as the auxiliary of Post 517 in order to assist the Post in furthering the ideal of peacetime service to America. Over the years four of the unit’s members would, themselves, become Gold Star mothers who lost sons in war. Toward the end of the 1920s, the commemoration of Memorial Day (Declaration Day) began to become a more formal and organized occasion with a marching band, uniformed Legionnaires and other veterans, all town school children, invited speakers and local dignitaries and a truck load of flowers, all parading the length of town and into the cemetery. After placing of flowers on the graves of veterans, a formal program of speeches and patriotic music was conducted in the open area near to the present Rostrum. The services concluded with the playing of taps. In early 1930 still wishing to bring a more formal solemnity to the occasion, some local Legion members and community leaders began to plan and to raise funds for a special War Memorial Rostrum from which to conduct services and give speeches. The committee called upon L. C. Bareham, a WWI veteran on the Mercersburg Academy faculty who taught mechanical drawing and who had visited many other war memorials, to design the Memorial Rostrum. It was to be constructed of native limestone from the quarry located behind the local public school and donated by Post 517. The steps, capstones and benches were to be Indiana limestone with the central pillar holding the dedication plague to be capped with Indiana limestone surmounted by a bronze American eagle. The cost was estimated to be about $2,300 ((with inflation figured in, equal to $28,073 present day). Completion was planned for Memorial Day, May 30th,1930. However, with only a week to the May 23rd Journal in a front-page story, pointed out that the Memorial committee still needed an additional $300 so the total cost would not fall upon its members who had already given much in time and talent. To further its appeal the Journal also printed another front-page article describing how all the Mercersburg school children of every class had made some contribution, noting in particular that the senior class had donated from its special treasury they had been saving since their ninth-grade year for their class trip to Washington. Additional funds were forth coming. Such was the patriotic spirit of the times. The Memorial Rostrum stood pristine for dedication on May 30th with great anticipation by people and veterans from communities around the area. Bleachers for the elementary school children who would sing America the Beautiful were set. The noted Morris Frock Drum and Bugle Corps from Hagerstown would march and perform at the services. The Mercersburg Band would play various selections. A double quartette from the high school would sing God of our Fathers. Dr. Boyd Edwards Headmaster of the Academy would deliver the main address. as other dignitaries would give speeches of dedication and acceptance by the borough of the Rostrum. Others would speak of the meaning of the day and “The Service of Mercersburg’s Sons in Time of War.” Dr. Archibald Rutledge, noted author and poet, wrote a special poem for the service, To the Heroes in Fairview. Then America was sung by all, a Benediction given, then silence broken by echoing Taps. So the Rostrum came into being. For 87 years and as many services it has stood as the place for all to gather and pay respects and honor to the Mercersburg area veterans.. In 1930 no one on that day could foresee that the crash of the stock market seven months before was sending our nation slowly into a Great Depression that for the next ten years would test the character of our country nor foresee that another great World War would call our sons and daughters once again to service and sacrifice. Nonetheless, through those trying years every Memorial Day was celebrated here. After WWII, the plagues on the end pillars listing the men who died in those two great wars were added by the American Legion. Today through volunteer work, special funding by American Legion Post 517, and community donations, the Memorial Rostrum, after pressure cleaning and removal of the badly deteriorated mortar joints, has been completely repointed by professional stone masons. 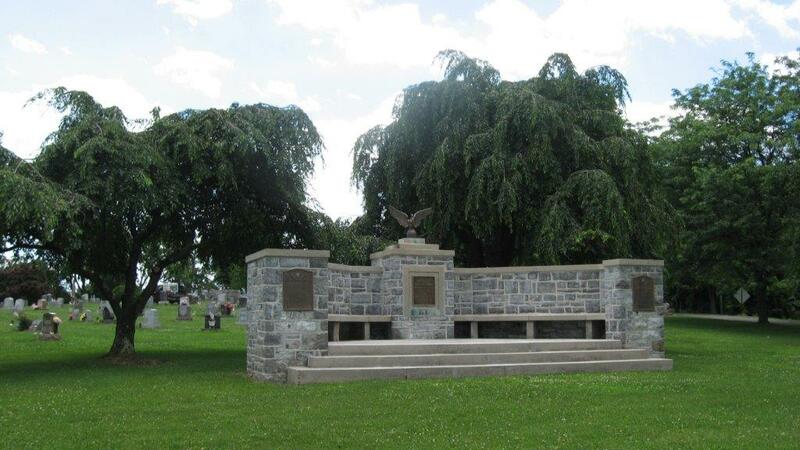 This was undertaken as a project of the American Legion to commemorate the 100th anniversary of America’s entry into WWI in 1917 and as a means of providing needed maintenance to original memorials of the era. May the Mercersburg War Memorial Rostrum now stand another 87 years, the symbol of our continuing honor to our veterans whose service and sacrifice have kept us free from tyranny and oppression. Of the 1,833 Franklin county veterans who served in WWI, 88 died during the war including 6 nurses. Nearly 50% were non-combat deaths mainly from the “Spanish” flu. From Mercersburg and surrounding townships, 207 men and one nurse served. Eight men from Mercersburg perished in the war, all between Sept. 11 1918, and Nov. 4 1918, the last within a week of the Armistice Nov. 11. CHARLES RUSSELL JONES Sept 11, 1918, Navy, Port Arthur Texas. ALVIN G. SHEETS Sept. 17, 1918, 53rd replacement draft infantry. LEWIS HIMES, KIA Sept. 29, 1918, 368th infantry, 93rd “colored” Div. HARRY L. LACKHOVE, KIA Oct. 13, 1918, 314th infantry 79th Div. WALTER SEVILLE, KIA Oct. 15, 1918, 126th infantry 32nd Div. JAMES C. ROCKWELL, KIA Oct. 24, 1918, 16th infantry 1st Div. LESIE S. ZEGER, KIA Nov. 4, 1918. 316th infantry 79th Div.